For the last few months, I've only been blogging once a month with my Secret Recipe Club group. I hate that I am not posting regularly (owing to many reasons), but I am grateful to SRC for keeping me posting at least once a month. But I have to take a break even from SRC because it just isn't fair to the other members when I'm not posting regularly. August will be my last SRC post. I will be applying for a break from the group. I hope to be back to blogging in a few months. This month, I just LOVED the blog I was assigned to. Not only did I find some awesome, mouth-watering recipes, but I also found so much that built me up in my spirit. Jessie Weaver is a gorgeous woman of faith, an awesome mom, wife and cook and I don't think you will be disappointed with the range of posts you will discover on her amazing blog. Thank you for everything, Jessie. I love what you write, and you have a regular reader in me! If you've visited my blog before, you probably know all my love for breakfast baking. It's more like an obsession. Muffins, scones, rolls, quick breads - I've done it all and I do it waaaaay more often than I care to admit. 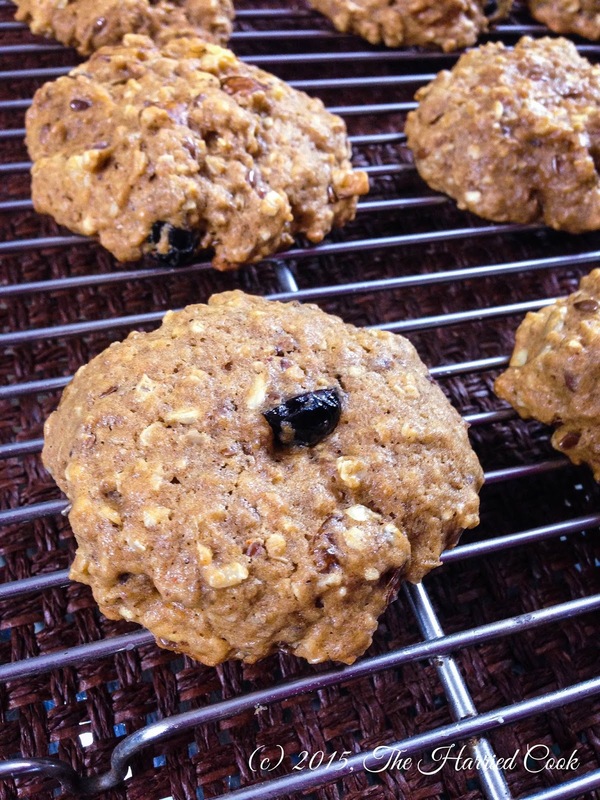 I found a few awesome recipes in these categories on Jessie's blog - the gingerbread white chocolate muffins, the chai spice scones (another SRC recipe) and a few more, but there was one that grabbed my attention. I saw the words 'brown butter' in the title, and I was sold. 1. Preheat your oven to 180C/350F and prepare a cookie sheet by lining with greaseproof paper or Silpat. 2. In a heavy-bottomed saucepan, melt the butter on low heat stirring until it is all melted. Allow it to keep cooking on low heat until the butter browns and gives off a heady, nutty aroma. This could take 10-12 minutes, and while it doesn't need stirring, you will need to watch it the whole time. It can go from browned to burnt in a matter of seconds. 3. Set the brown butter aside for 10 minutes to cool. 4. Stir in the honey, salt, baking soda, cinnamon powder and vanilla extract. 5. Add the eggs and buttermilk and stir well to combine. 6. Stir in the flour, granola, chocolate chips, oatmeal and flaxseed meal. Mix well. 7. Using an ice cream scoop, scoop out the cookie dough onto your prepared baking sheet. Allow some space between each cookie and the next. If you're shaping them by hand, form 2 inch sized balls and slightly flatten on the baking sheet. I got about 30 large cookies from this recipe. 8. Bake in batches, allowing each batch to bake 15-18 minutes. The cookies will be golden brown on the bottom and slightly risen. 9. Allow to cool on the sheet before transferring to a wire rack to cool completely. 10. Serve fresh if possible. Store leftovers in an airtight container. I didn't make many changes to this recipes. Just added some oatmeal instead of the oat bran she recommends (I didn't have oat bran at hand), and some flaxseed meal. And I just mixed everything in the same saucepan in which I made the brown butter. It really is an amazing one-bowl recipe! I will be back in August for one last SRC post. See you all then! It's Secret Recipe Club time again! If not for SRC, my blog would be already dead and gone. After two more months of SRC, I will be taking a few months off though. I need some time away from the blog to focus on the family and while I will miss blogging, I know I will be back. This month, I was super excited to be assigned the fabulous blog Camilla's Culinary Adventures! Oh man - Camilla really is a star. She manages a fabulously loaded blog on which she posts amazing recipes very regularly, she runs a beautiful family and she is also our Group B moderator here at SRC. I need lessons from this lady on time management! Hats off to you, Camilla. You're an inspiration! I honestly had such a hard time picking a recipe this time around. She has so many recipes in almost every style of cooking. I was tempted to pick a bread recipe, or a Madeleine recipe (I adore Madeleines) or one of her amazing cupcake recipes since my daughter has been nagging me for cupcakes. Finally, I ended up with a breakfast recipe when i needed to make a quick batch of scones for someone. I remembered seeing this recipe on Camilla's site and went back to it. The recipe is originally strawberries and cream but I didn't have strawberries in the house at the time, and so I made it with blueberries instead. I'm sure it would have been amazing with strawberries though! Next time! 1. Preheat the oven to 180C/350F. Line a baking sheet with parchment paper or silpat. 2. In a large bowl, combine the flour, baking powder, baking soda, sugar and salt. Stir well to combine. 3. Add the butter and using either a pastry cutter or just the tips of your finger, work the butter into the dry mixture until the mixture resembles chunky breadcrumbs. You could even do this in the food processor. 4. Add the cream and egg and gently bring the dough together. 5. 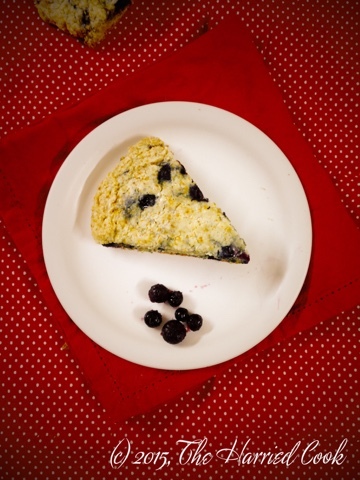 Once the dough is formed, add the blueberries and be very gentle to disperse the berries. Take care not to bruise the berries too much. 6. Transfer the dough onto your prepared baking sheet and pat into a circle that's about 1/2 inch thick. Slice into wedges and drizzle the top with the reserved cream. 7. Bake in the preheated oven for 18-20 minutes or until the scones are lightly golden and raised. 8. Serve warm drizzled with a glaze of your choice or with cream and jam. These scones were different from the ones I've made before and we all loved them - especially my husband! The base and edges had a crispy cookie like texture that we couldn't get enough of, and the middle was soft and crumbly, and as Camilla mentioned that her son noticed, - the flavour was intensely buttery and delicious! 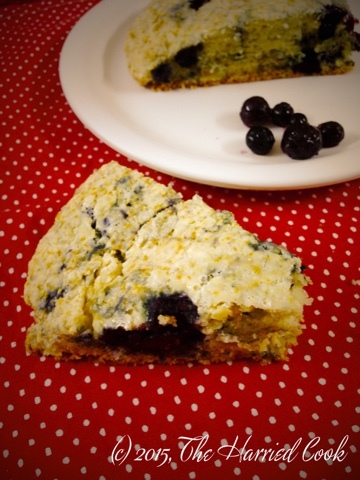 Thank you for this amazing base recipe for scones Camilla. You can bet I'll be using this to make many amazing combinations for years to come! Please go check out Camilla's blog and I promise you a treasure trove of recipes that you can't stop bookmarking! Don't forget to check out the other awesome SRC recipes below! Yes. I know. It has been TWO WHOLE MONTHS since my last post here on the blog. I apologise for the long silence. It has been a crazy time for me. And I've been feeling really sick and out of it. The good thing is that I am starting to feel a lot better and I hope to be blogging regularly again. I was glad to get back into the kitchen earlier this month to try out my recipe for this month's Secret Recipe Club post. This month I was assigned an awesome blog called A Spoonful of Thyme. I am no stranger to this blog and I have visited it before and even cooked from it! You guys know I don't usually blog about cooking recipes - mostly baking. But let me tell you - this rice recipe is awesome! So you won't be surprised when I say that I was thrilled to find I was assigned Kate's blog. Kate comes from a family of cooks and with cooking in her DNA, I'm not surprised that there are so many incredible recipes on her site! I loved cooking from your site, Kate! I've bookmarked a ton of recipes to try - especially the fabulous pie recipes which you remember your mom and grandma for! I absolutely intend to try this Winter Fruit Pie with Walnut Crumb ASAP. Who cares if it is the middle of a blazing hot summer where I live. This will get made! 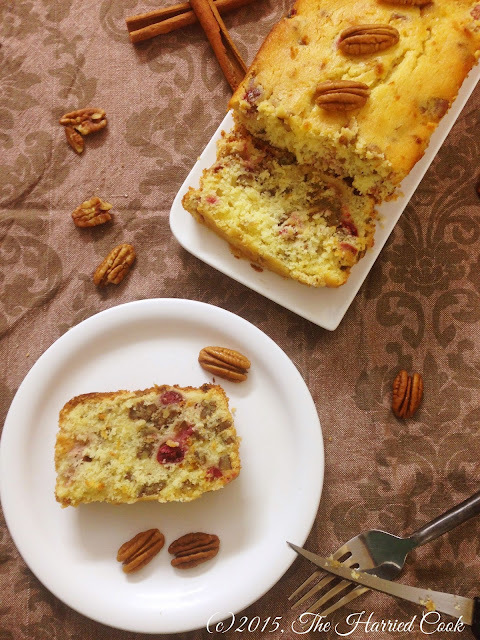 The recipe I chose to make and share with you today is this absolutely flavourful, moist divine quick bread that my family and I LOVED. I am sure you will too! 1. Prepare your loaf tin by lightly greasing and flouring it. Kate recommends a 6-cup capacity loaf tin. Preheat your oven to 180C/350F. 2. Sift together the flour, baking powder, baking soda, salt and cinnamon. Set aside. 3. Stir together the yogurt and orange juice. Set aside. 4. In a large bowl or in the bowl of your stand mixer using the paddle attachment, cream together the butter and sugar for 3-4 minutes until creamy and light. 5. Beat the eggs in, one at a time, beating well after each addition. Continue beating for a further 2-3 minutes until the mixture is fluffy and creamy. 6. Beat in the orange zest and extract. 7. Add the flour mixture in small quantities, alternating with the yogurt mixture. Make sure you finish by adding the last of the flour mixture. NOTE: This mixing should be done on low speed so that you don't end up working the gluten in the flour. Do not over-mix. Stop mixing as soon as the flour has been incorporated in each addition. If you mix too much at this stage, you won't have a bread with a tender crumb. 8. Add the cranberries and pecans and fold them in by hand until evenly distributed. 9. Pour the batter into the prepared tin and bake for 50-55 minutes or until a cake tester inserted in the centre comes out clean. Do not over-bake. Keep in mind that if you are using a smaller sized loaf tin, the baking time will decrease. Keep an eye on the bread and remove as soon as it is done. 10. Allow to cool in the pan for about 15 minutes and then gently turn out onto a wire rack to cool before slicing and serving. I made double this recipe because I had gut feeling that this was going to be very popular around here - and I am so glad I did this! I ended up with two loaves (baked in 5 cup capacity loaf tins), plus 6 muffins with this recipe and I am enjoying the coveted last slice right now as I write this post. The texture was just divine - moist and melting and don't get me started on the flavor! My only change to the recipe was the addition of a dash of ground cinnamon - a flavor I love in combination with orange! I had to skip the orange oil since I didn't have it in my pantry, but I used a splash of orange extract instead, and I increased the amount of orange zest in my recipe. I made one loaf with the pecans and the rest without because my kids don't really enjoy nuts in their bread. 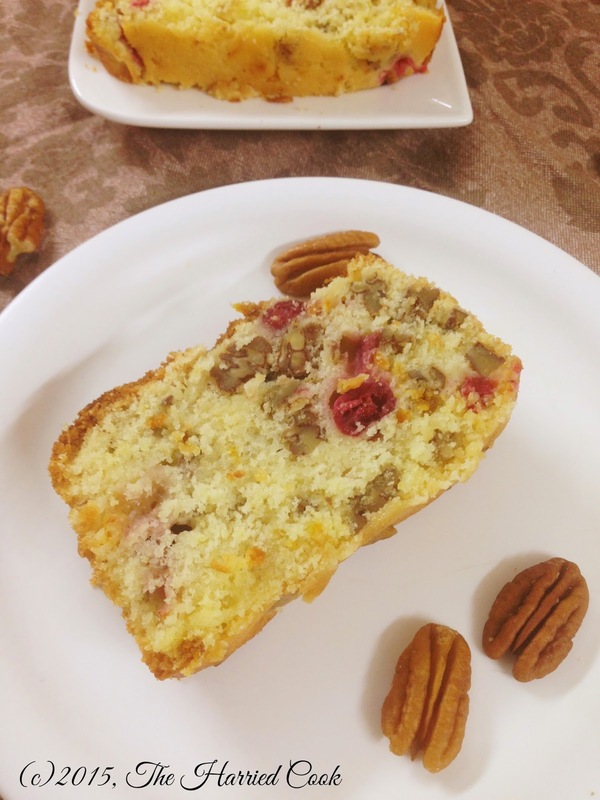 My husband adores pecans and so he ate the pecan loaf almost entirely by himself. Personally, my favourite part of the loaves was the ruby red cranberries. It is amazing how the cranberries are almost inedible when raw and fresh but taste SO good when baked into something like this. Just amazingly yummy! 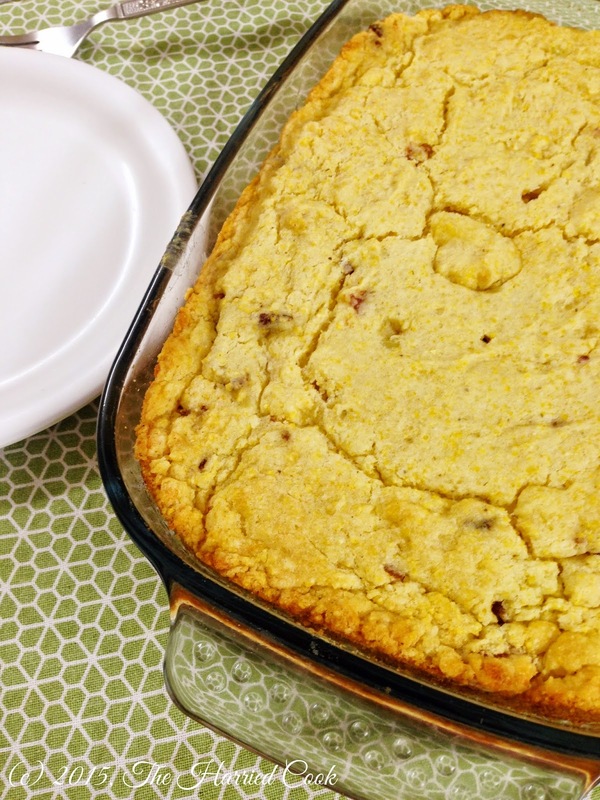 If you're looking for good ways to use cranberries, this bread is a winner! And if you still have tons of cranberries left, please please please make this Cranberry Hazelnut Coffee Cake. You will not regret it! There are a few more yummy cranberry recipes in my recipe index, if you want them! 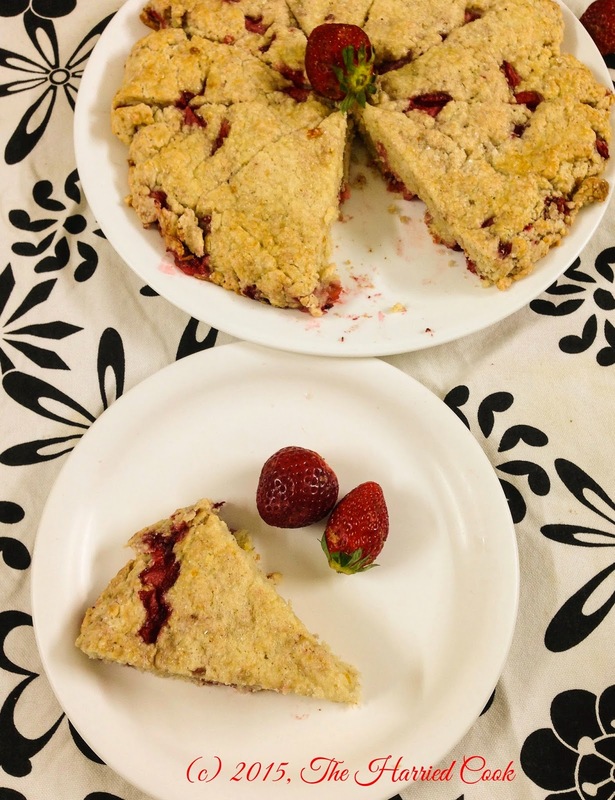 Check out the other posts below for more Secret Recipe Club recipes from the group I bake with! I always look forward to the second Monday of each month. That's when my group posts their reveals as part of Group B of Secret Recipe Club. I usually so look forward to my blog assignment each month that I bake from it within the first week… and then I have to wait three whole weeks to write about it! This month, my assigned blog was Flavors by Four - an amazing blog by an awesome cook, baker and blogger duo - Susan and Nicole. This mother-daughter team takes turns blogging about the yummy recipes they find and cook! I love that they do this, and I hope that one day, my daughters will want to share my blog with me! My older one is already super interested and I can't get her out of the kitchen… :) Thanks for the yummy recipes, and inspiration, Susan and Nicole! I had quite a few recipes shortlisted at first - my favourite being these awesome looking Buckeye Brownies! And since I love muffins so much, these Dark Chocolate Cherry Muffins were a close second. But after much pondering and browsing, I chose these delicious, buttery Caramel Apple Shortbread Bars. 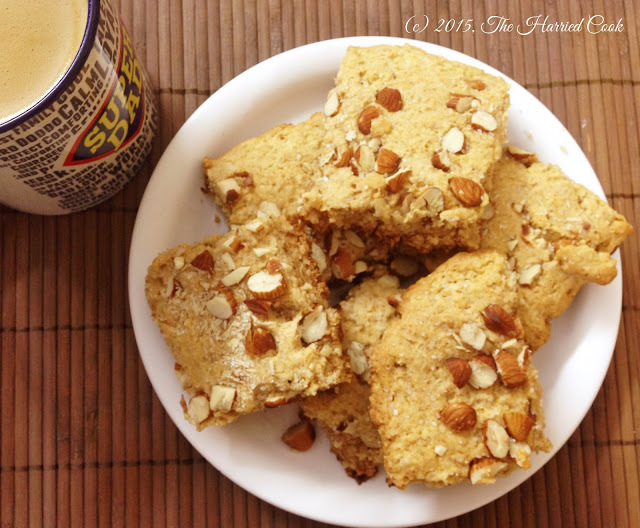 These are so flavourful and delicious, and were a hit in our home. The only change I made was that for some reason, my caramel was a little too runny and I wasn't sure I should pour such runny caramel over the shortbread base. So I used a tiny amount of cornstarch to thicken the caramel before using it. I think maybe it was the kind of apples I used. So if you have a thickish caramel, please feel free to omit the cornstarch I have used. 1. Preheat your oven to 180C/350F. Prepare a 9"x13" baking tin by lining the bottom and sides with parchment or non-stick baking paper. I used non-stick baking foil. 2. In a bowl, combine the flour, sugar and salt. Stir to combine. 3. Add the softened butter and using a mixer or a wooden spoon stir to bring the dough together. Mix until the dough is uniform but do not over-mix. 4. Press about 2/3 of the shortbread dough into the bottom of the prepared baking tin. Allow to parbake in the oven for about 20 minutes. This is sufficient time for you to get the filling ready. 5. To make the filling, combine the sugar and water in a heavy bottom saucepan and stirring occasionally until the sugar has completely dissolved. Then allow the mixture to come to a boil. Keep an eye on the sugar and watch it while it caramelises. It will turn a beautiful amber colour. Once you've achieved this colour, it can go for caramelised to burnt in a matter of seconds - so work quickly. 6. As soon as the sugar is caramelised, stir in the sliced apples. This can cause the sugar to seize up and harden a little, but keep stirring and the sugar will dissolve. Once you have apples in smooth caramel, add in the cream and butter, stirring constantly. This mixture may bubble but it will subside. 7. At this stage if you feel the mixture is too thin and runny (like mine was), dissolved about 2 tbsp of cornstarch in the caramel sugar and stir it back into the saucepan. Allow to cook for 3-4 minutes until the mixture is thick and luscious. 8. Remove the par-baked base and pour the caramel filling over the top. Spread it out evenly using a spatula. 9. Crumble the reserved 1/3 of the shortbread dough over the top of the caramel apple filling. 10. Continue baking for a further 15-20 minutes until the shortbread on top is lightly golden and the caramel is bubbly but set. 10. Allow to cool completely before cutting into squares. I let it sit overnight before cutting it into squares. These were absolutely delicious. Everyone's favourite part was the yummy shortbread crust. I can imagine using the same crust for tons of different fillings. So delicious! And the caramel apple filling was so addictive that you could eat it with a spoon. 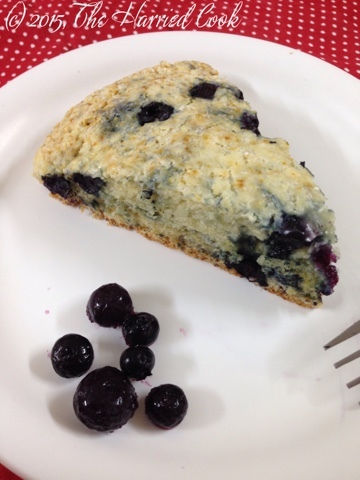 Thank you Susan and Nicole for a truly delicious recipe! Don't forget to check out the other awesome Group B recipes in the link-up below! I love that strawberry season comes twice a year. The whole family rejoices when we walk into the market and find a table filled with box upon box of ripe, red strawberries. Both my daughters are just plain strawberry-mad! I've been buying so many boxes! Most of the berries are just washed and eaten, but I usually manage to hide a box or two to bake with. I love baking with fresh strawberries. This recipe is one that I've made a few times now. It is no secret that our breakfast favourites are muffins and scones. So, I'm always trying out new scone and muffin recipes, and my family never complains. Of course, when you're trying out so many new recipes, you're bound to have some recipes you never want to try again. This isn't one of them. If you want a lighter crumb and are baking for an occasion or for guests, and you don't want to worry about health, you could just bake it with all regular flour. 1. Preheat your oven to 200C/400F. Line a baking sheet with parchment or greaseproof paper, or use a silicone baking mat. 2. In a large bowl, combine the flours, 1/3 cup of sugar, baking powder, flaxseed meal, orange zest, salt and ground cinnamon. Mix well. 3. Add the cold butter and using just the tips of your fingers, work the butter into the flour mixture. Work quickly, and gently until the mixture resembles bread crumbs. 4. Add the cream and bring the dough together gently. 5. Turn the dough out onto a work surface, and add the chopped strawberries. 6. 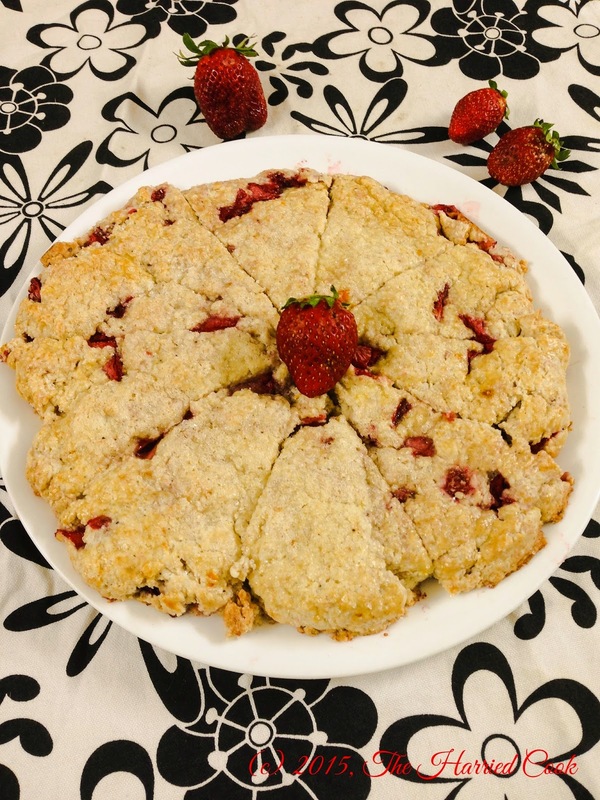 Working very lightly, so as to not bruise the berries too much, gently work the strawberries into the dough. 7. Transfer the dough onto your lined baking sheet, and form into a rough 8 or 9 inch circle. Pat down the dough until it is about 1/2 inch thick. Using a sharp knife, cut the circle into six or eight wedges. 8. Brush the top of the scones with the egg and sprinkle with the 2 tbsp of sugar you have reserved. You could also sprinkle the top with chopped nuts. 9. Bake in the preheated oven for 12-15 minutes or until the top is a light golden brown. The flaky, buttery scone is rich with cream and loaded with tangy-sweet berries that drip their juice and make a very welcome mess. I wish I could get my hands on some clotted cream. I think it would be perfect with these particular scones. My husband had a valid complaint. While he love the sugary crunch on the top of the scones, he felt these scones would benefit with some more texture and crunch. So the next time around, I thought I'd throw in some hazelnuts or pistachios for some texture. 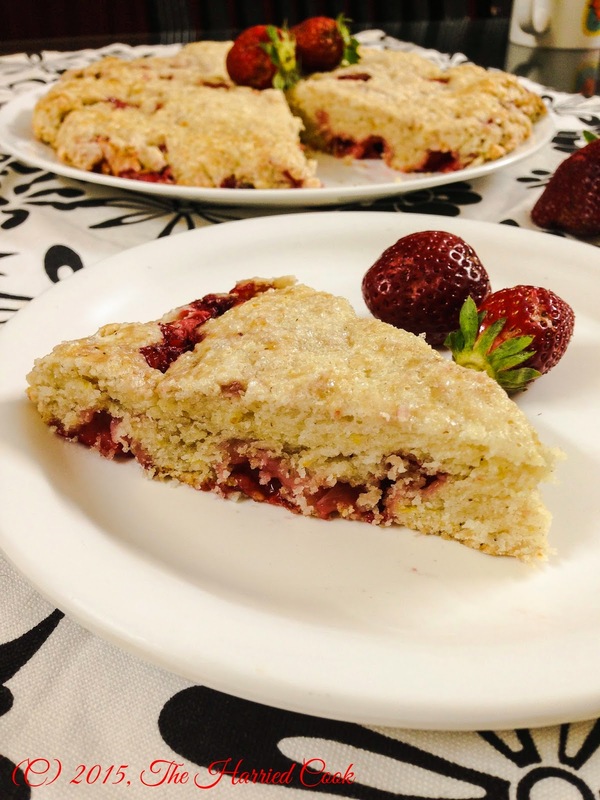 But, for now, watch out for another awesome strawberry recipe to celebrate the season of yummy strawberries! I get so excited every time the reveal date for the Secret Recipe Club rolls around. It is just so much fun to see who has been cooking and what everyone's been cooking! I missed having SRC in January, but it was our month off for the year. And now I'm back and ready to go! When I received this month's assignment, I was in awe of the site. The site has so much going on, and in a great way! And when I read the 'About me' section, I knew just why. She isn't a just a blogger like me; she's a blogger who is a professional trained chef! I'm so happy to introduce you to Chef Becca from It's Yummi! She's just amazing, and SO versatile. Whether it's a fancy dessert, an elaborate main course, a simple starter or a healthy snack - she's got it all! Visit her and I know for sure you won't be disappointed with what you find. As always, I had a rough time trying to pick just ONE recipe from Chef Becca's blog. So I ended up making two this time around. Actually, originally picked only one - a cookie recipe. Unfortunately, I neglected to take pictures before I put the cookies out when some friends came over. I figured I'd take the pictures after they left with all the leftover cookies. Well, who would have thunk there would be no leftovers! I recommend her Triple Chocolate Cookies, for sure! She has some fabulous muffin recipes too! I have several bookmarked! 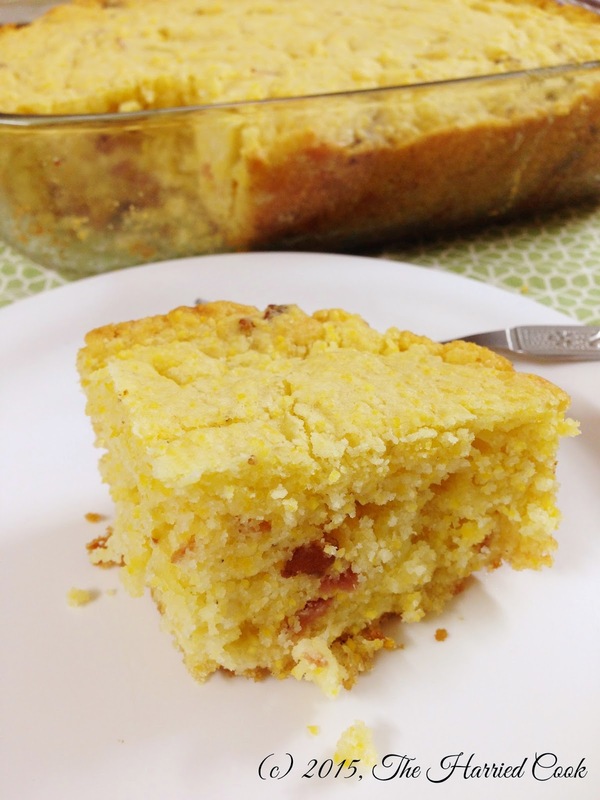 The recipe I finally made for this month's reveal was her Bacon Cheddar Cornbread. It was my birthday on Saturday, and I decided to make one of my favourite meals. 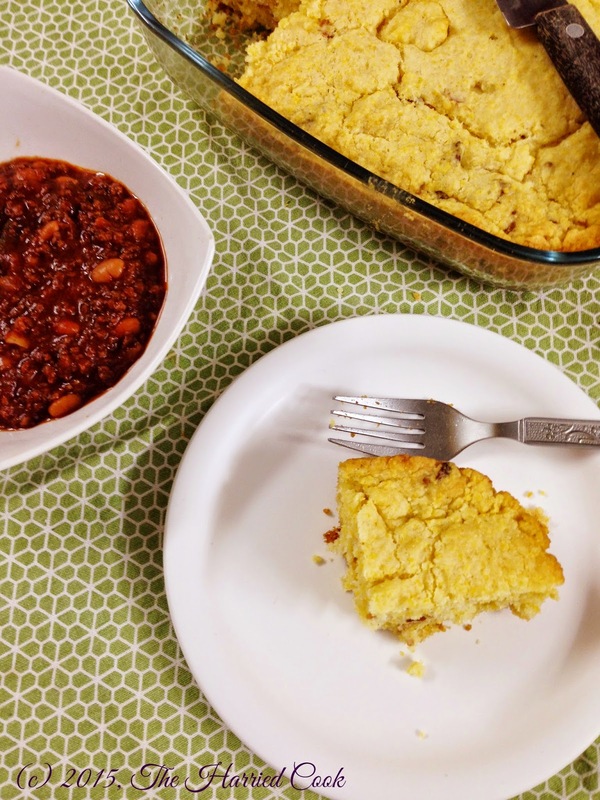 So we ate this yummy cornbread with my Beef and Navy bean Chili and it was oh so yummy! 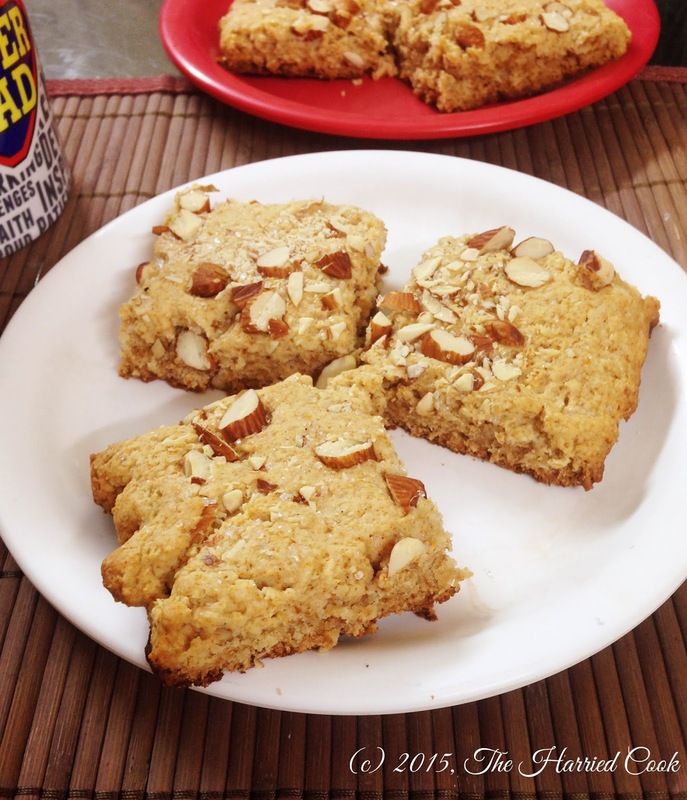 Chef Becca uses her homemade Bisquick mix in this recipe. I just halved her Bisquick mix recipe, used what I needed for this recipe, and stored the rest in the fridge for later. So convenient! I just combined 4 cups all purpose flour, 2 1/2 tbsp baking powder, 1 tsp salt and 1 tbsp sugar. Then, I rubbed in 1/2 cup unsalted butter until I had a mixture that resembled fresh bread crumbs. Since I used butter instead of shortening, I store this mix in the fridge. 1. Into a 9x5 rectangular glass baking tray, or a cast iron oven-safe skillet, put 1 tbsp of butter. Place this into an oven and begin to preheat the oven to 180C/350F. 2. In a large bowl, combine the baking mix, the cornmeal, sugar, baking powder and salt. Stir to combine. 3. Combine the egg, creamed corn, milk and oil in a medium bowl. 5. Stir in the chopped bacon and the shredded cheese. 6. Remove the hot baking dish from the oven. Pour the batter into the tray over the melted butter. 7. Bake for about 25-30 minutes or until lightly golden and a toothpick inserted into the centre comes out clean. 8. Serve warm with extra butter, and some honey, if desired. We ate this cornbread straight out of the oven with super spicy chili and we really, really enjoyed it! I've been dying to post this recipe! I had it all ready to post about a week ago, and I just had some editing to do. And then I got sick. And really sick. It took me a week to get back on my feet, and so, here I am! Better late than never, huh? 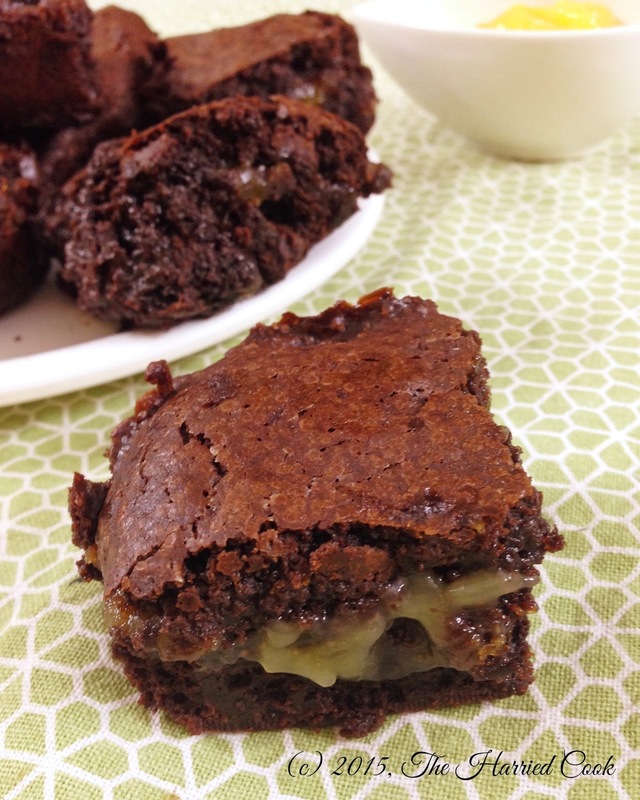 These brownies are phenomenal! They happened because I got this weird craving (no I'm not pregnant again!) for something with dark chocolate and lime or lemon. I don't know why and how I craved this unusual combination, but I was just determined to do something about it. I have this awesome baker friend whose opinion I like to get. When I told her what I had planned, she said "Don't do it!" Gosh. I was confused and almost didn't make these. But, I'm happy to report that for once, she was wrong. And she rarely is! This recipe totally, totally rocks! The base recipe for the brownies is one of my favourite cocoa brownie recipes - Alice Medrich's best cocoa brownies. For the lime element, I used my favourite homemade lime curd recipe. I'm sure this would work just as well with good quality store-bought lime or lemon curd too. Orange curd would work too, if that floats your boat. And the rest is history. 1. Preheat the oven to 180C/350F. Grease a 7" or 8" square tin and line with parchment paper covering the base and all the sides. To do this, cut out two long pieces of paper. Press one into the tin, leaving an overhang on opposite sides. Press it in well so that the paper is sticking to the base and the two opposite sides. Now do the same thing with the other paper, covering the base and the remaining sides. Again make sure you leave an overhang on the sides. I've done this with plain old aluminium foil, and it works just as well. 2. In a heavy bottomed saucepan, melt the butter along with the sugar, cocoa powder, and salt. Stir until the butter has completely dissolved and the mixture has heated through and is feels hot when you stick your finger in the mixture. Set aside to cool until warm - about 15 minutes. 3. Stir in the vanilla and beat well to incorporate. 4. Beat in the eggs, one at a time, making sure you beat well after each addition. Spend some time on this step and beat for at least 3-4 minutes vigorously. 5. Add the flour to this mixture and stir until you can't see flour streaks anymore. At this point. Alice Medrich recommends beating the mixture with forty vigorous strokes. So really get those arm muscles working and beat the batter at least 40 strokes. I think we may have gotten in 60-70 strokes. 6. Pour half the batter into the prepared tin. Smooth out to make sure you get the batter into the corners. 7. Dollop the lemon curd all over the surface of the batter. Gently spread the curd so it is a fairly even layer. Don't beat it in but try to keep it as a distinct layer. 8. Top the lemon curd layer with the remaining brownie batter and smooth the surface. 9. 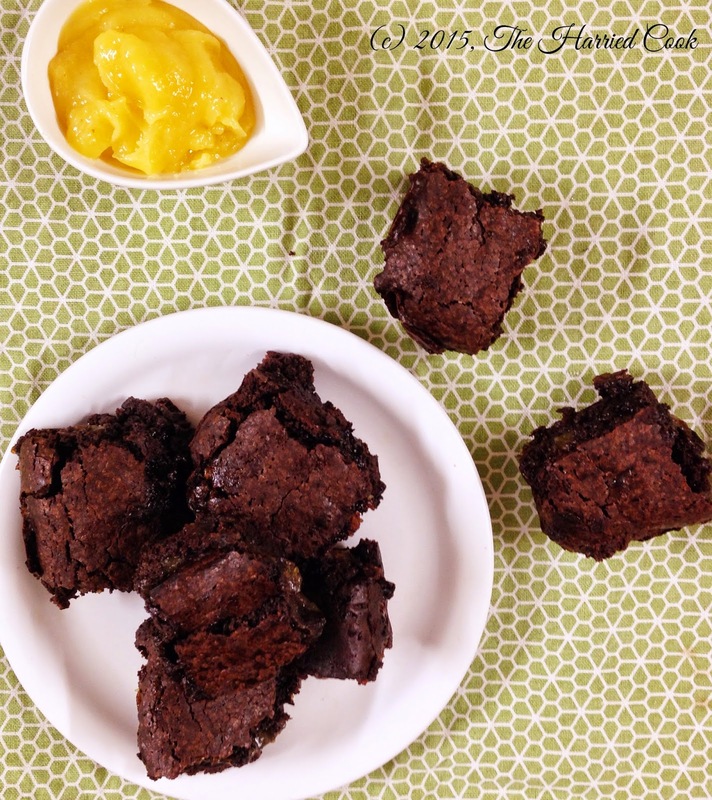 Bake in the preheated oven for for about 20-25 minutes or until a toothpick inserted into the middle comes out with gloopy lemon curd and a slight moist brownie batter. 10. Allow to cool completely before using the overhanging paper to lift out the brownies onto your work surface. 11. Cut into 16 (or 25) squares. The combination was really awesome. This base brownie recipe is one of my favorites and gives you really deep, dark and fudgy brownies. This combined with the tart, oozy lemon curd cutting through the rich chocolate was just perfect. As always, I intentionally undercooked them. So getting perfect squares was impossible. But my husband said it best when he said "If you could cut the brownies into perfect squares, I probably wouldn't like them as much!" I guess we sacrificed looks for something totally decadent! I think some white chocolate chips would work great in the recipe. I'm not sure about what nuts would work here. Personally, I don't like any nuts in my brownies. I feel like ruins the fudgy texture I so crave and enjoy. 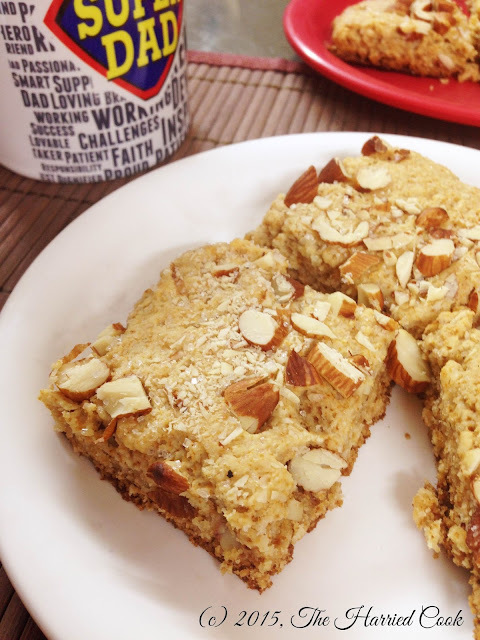 If you try this recipe and decide to use nuts, please let me know if it works! You should try this recipe. I am sure you won't regret it! HAPPY NEW YEAR! I hope 2015 is a good year for all of us. I've been so bad at posting! And here I was, resolving to post more regularly in 2015! It has been a hectic year so far. We've been barely cooking and eating at home. For the last few days, things have become slightly less crazy, and we've all grown tired of eating out. So here's my first post for this year. This recipe is from a book I got as a Christmas gift. It's a compilation of baking recipes by Martha Day. The book has tons of awesome sounding recipes from all over the world! Unfortunately I'm unable to find a link to an online store that's selling this particular book. This morning for breakfast we ate this delicious Monkey Bread. It was really, really good! I made the dough, finished the first rise and assembled the bread last night and left it in the fridge overnight. This morning, I took it out of the fridge at about 5am and let it sit out on the counter till around 7:30. We had fresh Monkey Bread for breakfast, and lots of smiles all around! 1. In a saucepan, combine the milk, water and butter. Heat gently until the butter has almost dissolved completely. Set aside for 5 minutes and stir in the egg, and the egg yolk and whisk well to combine. Check the temperature and allow it to cool until the mixture is slightly warm - about 105-110F. 2. In a large bowl, or in the bowl of your stand mixer, stir together the flour, instant yeast, salt and sugar. Set aside. 3. When the milk mixture is warm, create a well in the middle of the flour mixture and pour the milk mixture in. Stir will a wooden spoon until the dough comes together. Then knead the dough using the hook attachment on your stand mixer or by hand until the dough is smooth and elastic. This will take about 7-8 minutes on your stand mixer at medium speed, and about 10-15 minutes by hand. 4. Coat a large bowl with oil, and place the ball of dough into the bowl, giving it a turn in the bowl to coat it lightly with oil. Cover the top with clingfilm and set aside for about 1-1.5 hours. You want the dough to double in volume during this time. 5. Prepare the coating ingredients by combing the sugars, pecans and cinnamon powder in a small bowl. Keep the melted butter in a separate bowl. Prepare a 9 or 10inch fluted baking tin by greasing it generously. I used a 10" angel cake tin. 6. At the end of the proofing time, deflate the dough and divide it into 32 even sized pieces. 7. Roll each piece of dough into a tight ball. Drop each ball into the butter and using a fork, fish out the ball and drop it into the bowl with cinnamon sugar. Roll the ball in this mixture until it is well coated, making sure that some pieces of pecan have stuck on to the ball. Drop the ball into the prepared tin. 8. Continue rolling and layering the balls of dough in the baking tin until you've used up all the dough. 9. Cover the pan with clingfilm and set aside for about 45 minutes or until the dough is risen and puffy. 10. Preheat the oven to 200C/400F. Bake the Money Bread for about 30 minutes or so or until the bread is golden brown. 11. Allow to cool for 10 minutes, loosen the sides using a knife and flip the bread onto a plate. 12. Serve warm and let people rip off a ball or five and enjoy! 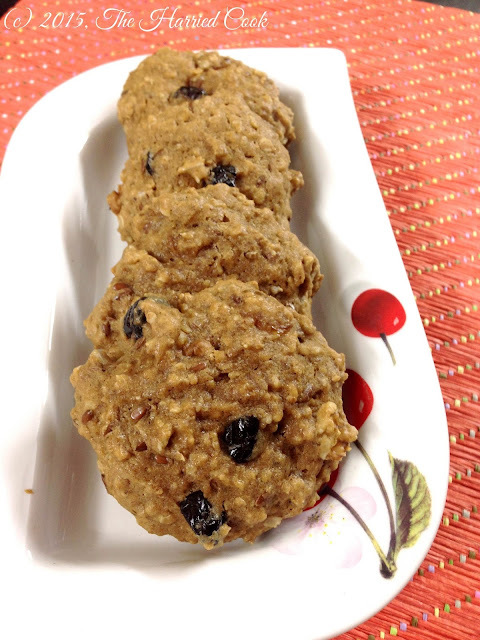 The original recipe contained 1/2 cup of raisins that are sprinkled over the balls of dough about halfway into layering. My husband isn't a great fan of raisins in cinnamon bread, and so I decided to omit. What the recipe doesn't suggest is drizzling the bread with decadent cream cheese glaze before serving. I high recommend this. I tried it after the pictures were taken, and it was just divine! And that's not even the best part! The best part of this recipe is those little pecan halves that drop off the bread and are sugar roasted to perfection. Crunching on those candied pecans was just bliss!